About 14 years ago, a little girl in Katwe, Uganda followed her older brother who was increasingly occupied with an activity after school. After seeing him disappear inside of a building, she wandered inside and found the Sports Outreach Institute, a sports club where there was a chess club meeting being held. Little did she realize that this event would change her life for the better. 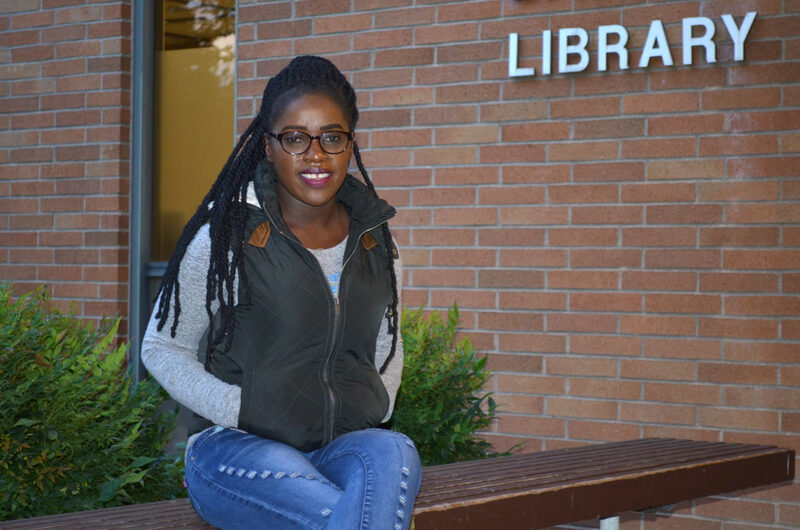 Phiona Mutesi at Northwest University. Fast forward to 2019, Phiona Mutesi has since traveled the world sharing her story to thousands and serving as an inspiration that one can find a beacon of light in the darkest of circumstances. Now a student at Northwest University outside of Seattle, Washington, her journey has come with many challenges. In addition, she ponders about unfulfilled expectations in chess. However, her story should be an example to us all. The book was released in 2012 and captured international acclaim despite the chess community being skittish. Chess purists seemed more interested in her FIDE rating than in the obstacles she overcame. Unfortunately, many chess players (especially from the west) cannot empathize with the type of abject poverty Phiona experienced and how difficult it was for her to survive in such conditions. On chess discussion groups, many boiled her story down to her rating, title and tournament activity. The moral of the story was completely missed or at least underappreciated. Phiona embarked on a whirlwind tour of the U.S. In the same year, Walt Disney Pictures optioned the rights to make the book into a screen play. 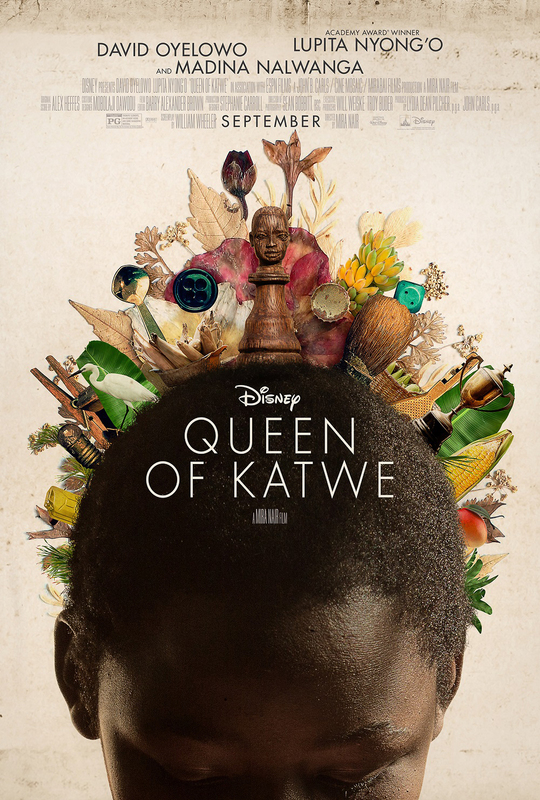 The film “Queen of Katwe“ came out in 2016. The movie was directed by Mira Nair (Monsoon Wedding, Mississippi Masala, Salaam Bombay) with the lead role going to Lupita Nyong’o whose parents are Kenyan. Nyong’o gained acclaim in 12 Years a Slave and would play Phiona’s mother, Harriett Mutesi. David Oyelowo (Selma, Red Tails, The Last King of Scotland) would play Robert Katende, Phiona’s coach. There was tremendous optimism as many interviews leading up to the movie’s release captured the details. The movie did not gain traction in the media. It may have been due to the fact that the marketing crew handled this as someone would a story on Bobby Fischer. The idea of a chess champion is a common one, but by comparison, Phiona’s feats had been rather modest. In addition, it was billed as a rags to riches story of a “chess champion” instead of a story about triumph over the most depressing conditions. Crothers may have even contributed to the narrative with his pronouncements about her becoming a “Grandmaster,” a very specific title in chess. There were many misleading characterizations about Phiona’s abilities. “My name, like, went so high, and my chess — it was still so low,” she says. “I wasn’t even the best chess champion, like, in Uganda. It was so hard. The movie fizzled. Nevertheless, Phiona was able to secure admission to Northwest University in the fall of 2017. While ecstatic about the new opportunity and perhaps releasing some of the pressures at home, there were challenges. Despite her fame, there were plenty of struggles including financial. Arriving at Northwest, Phiona had not used a computer before. Completing a single assignment was a tremendous task. 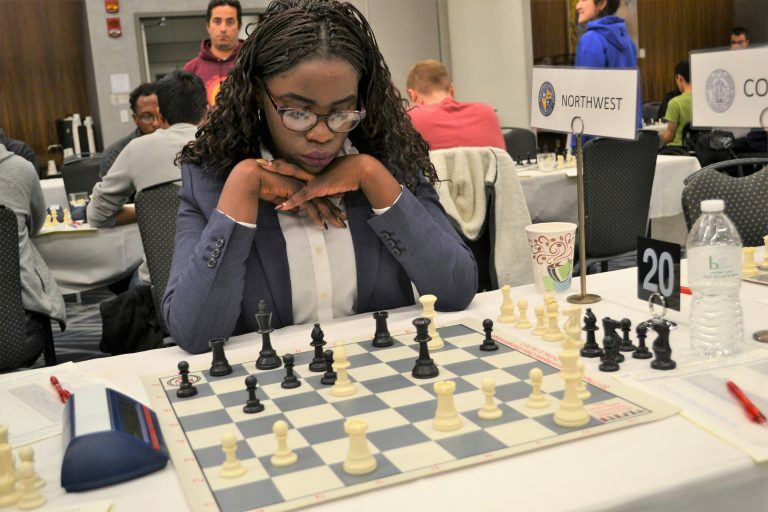 Today, Phiona is completing her second year at Northwest and has played for their Pan-Am Intercollegiate chess team. While chess has provided some relief from the rigors of study, it was socially challenging in the beginning. Phiona Mutesi at 2017 Pan-Am Intercollegiate Tournament. She also noticed how different things were in the U.S., a decidedly more individualistic society. At home in Uganda, there was more of a community feeling that everyone is accountable for each other. “I never appreciated it until I came here,” Phiona reflects during the aforementioned interview. Her scholarship covers tuition, but other living expenses are her responsibility. She has to fend for herself and has done motivational speeches to help cover costs of school. It leaves little time for chess. According to the WBUR interview, her zeal for chess may be subsiding. “I don’t feel like I really have love for chess like the way I used to have,” she says. “Because, during that time, I felt like [chess was all] I had to use in my life. But, right now, I feel like there are a lot of stuff that I can do in my life. I feel like chess has opened the door for me. There are so many similar stories coming out of Africa. The latest is of a Nigerian boy Tanitoluwa Adewumi whose family migrated to New York in 2017 only to spend the next 18 months in a homeless shelter. Tani won an age-group championship while living in the shelter and the story went viral. The family has raised (at last count) $217,236 worldwide in one week! While the conditions were totally different for Phiona, I’m sure she could give some sage advice to the Adewumi family. Chess is part of a journey, not the destination. Phiona’s life lessons will become much more impactful than any accomplishments should could ever gain in chess. We would hope that this example will lead more boys in girls out of the “poverty of thinking” whether it is in Katwe, or any desolate ghetto anywhere on the planet. True Harold (could it be harold wanyama the Ugandan chess player? ), at least she gets a shot at life she couldn’t have gotten without chess.. It is a story the chess community should take as a triumph, but the point was missed. 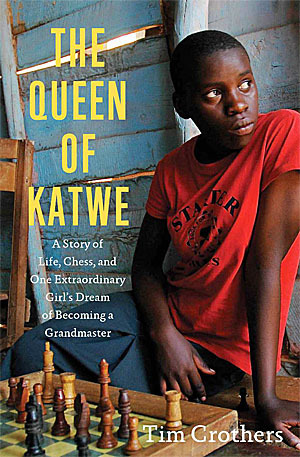 Where can we get a Movie Poster / Queen of Katwe for Chess Club!